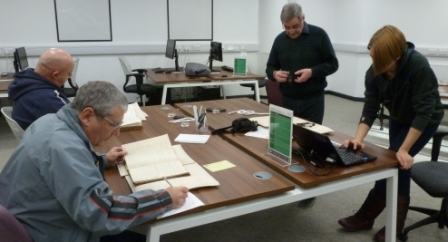 The Rugby Football League Archive cataloguing project as funded by the National Cataloguing Grants Programme for Archives is drawing to a close this week so it is a good time to look back on what has been achieved – and look forward to future work on the collection. 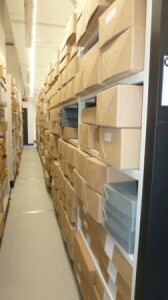 In February 2014 the dedicated Collections Access Officer for the Rugby Football League Archive began work on the 900 containers (either boxes or loose items) of material. With such a large collection it was fortunate that two dedicated volunteers, David Gronow and David Thorpe, had begun listing sections of the collection in 2012. The Collections Access Officer began by taking a crash course in the history of rugby league (referring extensively to the invaluable studies by Professor Tony Collins) and getting an overview of the collection – looking at lists and exploring the shelves and boxes! The next phase was to develop a structure to arrange the current collection and be robust enough to accommodate records created by the Rugby Football League in the future. This process took considerable time and thought but will ensure that the cataloguing project will not have to be repeated – even if the Rugby Football League restructures its organisation the catalogue structure should still accommodate its records. Once the catalogue planning phase was underway it was time to begin the long process of arranging and describing the records onto the electronic catalogue, repackaging them into robust archive boxes quality along the way. As part of the cataloguing process the Collections Access Officer and volunteers working on the collection have removed hundreds of duplicate records – totalling 22 boxes! This has freed up valuable shelf space but will also have other benefits. The Heritage Quay Engagement Officers will use some of the duplicate records in activities for adults and children, while others may be sold by Rugby League Cares to help support future heritage and charitable work. During the cataloguing project there were some exciting additions to the collection including the Dai Jenkins Collection and the Mike Stephenson Collection. After all the reboxing, additions, and removal of duplicates, the number of boxes now stands at 568 boxes! 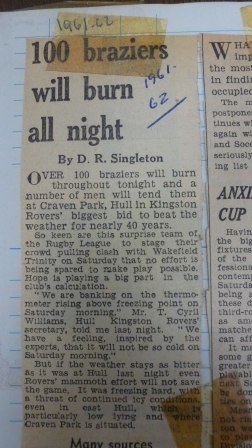 Once the cataloguing work was completed, information files (which are known as authority files) on people, places, organisations and events related to rugby league were attached to the records to allow links to be made between records. As records are used over time, and more information becomes available, these links will be expanded – for example, if an interesting reference to Dai Jenkins is found in a programme then the information file for Dai Jenkins will be linked to that programme to assist future researchers. The cataloguing project was only funded for a year, so not everything in the collection could be described in huge amounts of detail. 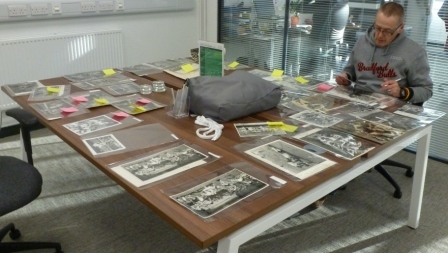 Over the coming months and years Heritage Quay staff will continue working with volunteers and rugby league heritage groups to enhance the catalogue – combining the expert subject knowledge of the rugby league community with the technical expertise of the Heritage Quay professionals. While 2015 marks the end of the dedicated Rugby Football League cataloguing project, it is the start of a new collaborative phase in making the Rugby Football League Archive accessible to anyone who wants to see it. 2015 also marks 120 years since the foundation of the Northern Union (later renamed the Rugby Football League) so watch this space for exciting anniversary events and activities! Every archive service needs a system for finding the collections and items described in lists, ranging from letters and numbers, to barcodes. 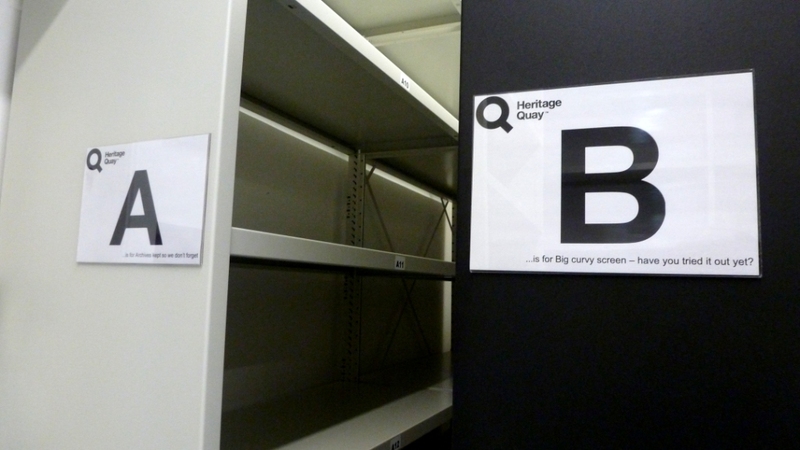 Here at Heritage Quay we use a system where every shelf has a letter and a number. We then make a note on the collection list of which boxes are on which shelf – simple! At the end of each row of shelves we put the letter that can be found on all the shelves so that we can see, at a glance, where we need to go. To make this a bit more fun we’ve added a rhyming alphabet poem below each letter that highlights different collections and facts about archives. Here’s a picture of A and B (A is for Archives kept so we don’t forget, B is for Big curvy screen – have you tried it out yet?) and if you’d like to see the rest come on one of our ‘Through the Quay-Hole’ behind the scenes tours where you can learn about the archive collections, the building, events and take a trip behind the scenes into the archive strong rooms. The next one is on 18th February at 1.30pm, there’s no need to book just come to the Heritage Quay exhibition area. This week our stalwart volunteer, David Thorpe, has completed the audit and listing of the Tom Webb and Tom Longworth scrapbook collections in the Rugby Football League Archive. This is a major step forward in making the collections accessible. Now we know what is in the boxes, and have an accurate list, the details have been added to the electronic catalogue and can be seen online at the Heritage Quay website. Tom Longworth and Tom Webb were pioneers in researching and recording rugby league history throughout the 20th century. Their scrapbook collections contain a vast array of information collected mainly from newspaper articles but also from their own experiences as rugby league fans and journalists. There are books about individual teams, statistics, players and tours; all of which are open for research by club historians, academics and any member of the public. This cutting is from Tom Webb’s scrapbook dedicated to ‘bad weather’ – an ever-popular British subject! The scrapbook describes various methods used by rugby league clubs in the 20th century to stop pitches freezing and avoid match postponements. These ranged from covering the pitch with a foot of straw, covering the pitch in river sand (which blocked the drains as soon as it rained) and setting up braziers on the pitch; to more unusual ideas such as electrified bars under a tarpaulin, and canvases impregnated with the brine used on bacon! This week I’ve been cataloguing financial records in the Rugby Football League collection. These records include cash books, records of gate receipts, correspondence and statistics. Financial records are often quite difficult to catalogue and may not always be the most exciting on the surface. However, they can give a valuable insight into the fortunes, expansion (and contraction) of an organisation for those who are willing to look beyond the rows of figures to find their meaning. Amongst the financial records relating to tours by the Great Britain team to Australasia and the Australian team to Great Britain are hand drawn maps showing the increase (or decrease!) in gate takings in Australia and New Zealand from 1946-1961. This week we have used records from the Rugby League collection to solve two mysteries about the playing colours of former rugby league clubs. In the early 20th century there were a number of professional or semi-professional rugby league teams who no longer exist and about which very little is known. Two mysteries we have come across concern the playing colours of Wigan Highfield (who played from 1880-1895 and from 1902-1933) and Runcorn (who played from around 1876-1918). Rugby league historians have speculated that Wigan Highfield’s colours were yellow and blue, and that Runcorn’s may have been yellow, green and white. But as no colour photographs survive of either team it has, until now, only been possible to speculate. So (drumroll please!) we are pleased to announce that the official colours for Wigan Highfield were a dark blue jersey with a red band, and blue shorts. Runcorn changed their colours on more than one occasion. In 1911 the club’s colours were myrtle green, but then in 1911 they changed their colours to cherry and white, and in 1913 they changed again to royal blue with a white collar. We’ve been busy working away to prepare digital scans and photographs to appear on the ‘big curvy screen’ and the digital exploration tables at Heritage Quay in October. The ‘big curvy screen’ will use motion sensor technology to allow exploration of highlights from the collections – instead of pressing buttons visitors will be able to use their hands and arms to control what is visible on the screen. This type of technology is probably familiar to fans of video games but is a new innovation for a heritage setting so we’re very excited! If you haven’t seen the ‘big curvy screen’ check out the architect’s fly-through for a preview of the screen and Wide Sky Design’s blog for the technology prototype development … then come and see if for real in the autumn!